Easily make beautiful tables and charts! -Navigate to the plugin WP Business Intelligence>Database Connections. Click “Add New”. -Fill out the form then “Create”. -Navigate to the plugin WP Business Intelligence>Queries. Click “Add New”. -Fill out the form then “Create”. Your returned results will appear at the bottom of the page. A good way to test your database connection is to query “SHOW TABLES” and then all of your table names should appear at the bottom of the screen(as highlighted in the red circle). There are many ways to customize your data based on your MySQL query. Please look-up some tutorials if you are not familiar with writing queries to a database. -Navigate to the plugin WP Business Intelligence>Data Tables. Click “Add New”. -Your example table will appear at the bottom of the page. You can copy the shortcode that is below your example table (highlighted in the red circle) to paste the table into a page or post. -Your returned results will appear at the bottom of the page. A good way to test your database connection is to query “SHOW TABLES” and then all of your table names should appear at the bottom of the screen(as highlighted in the red circle). There are many ways to customize your data based on your MySQL query. Please look-up some tutorials if you are not familiar with writing queries to a database. -Navigate to the plugin WP Business Intelligence>Charts. Click “Add New”. -Select chart type from the drop down menu. Click “Create”. 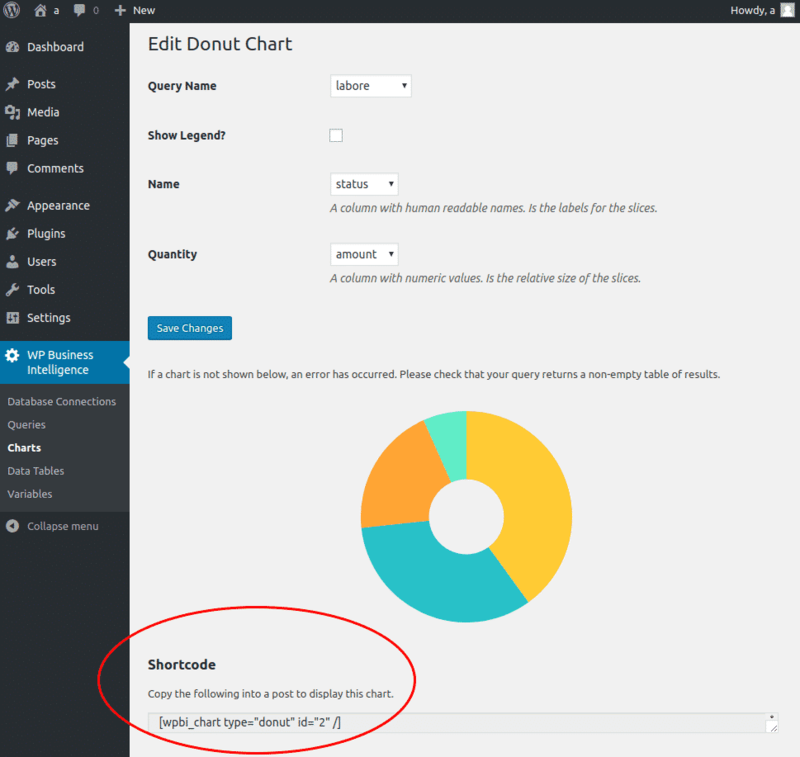 -You can copy the shortcode that is below your example chart (highlighted in the red circle) to paste the table into a page or post. 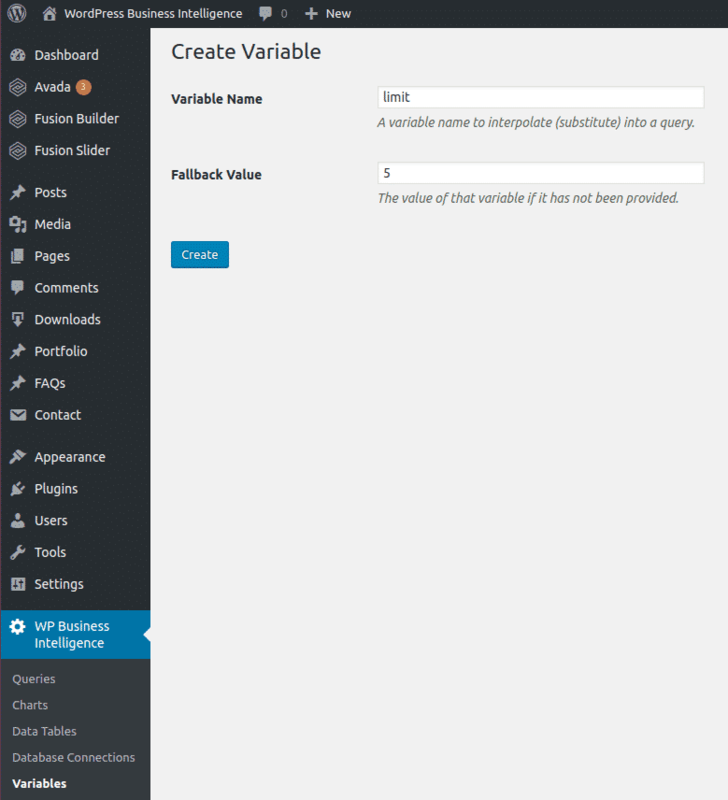 -Navigate to the plugin WP Business Intelligence>Variables. Click “Add New”. Pass the created variable into a query. Now requests to yoursite.com/path-to-your-chart?limit=10 will return 10 results. Requests to yoursite.com/path-to-your-chart, will return 5 results. Find the versions of the operating system that PHP is running on, the PHP version and the Microsoft SQL Server version. Consult the support matrix to find out which version Microsoft PHP Drivers you need. For example if you have PHP 7.2, and SQL Server 2017, then you’ll need Microsoft PHP Drivers version 5.3. Download and install the Microsoft PHP Drivers on the PHP server. There are guides for some OSs at the bottom of this page that can guide you through the installation of the latest versions. Enable the PHP extensions: pdo_sqlsrv and sqlsrv. If you have done everything correctly you can run the command “php -m” to show which module are installed. If it’s working, you should see that sqlsrv and pdo_sqlsrv are included in the output. Once you purchase the pro or enterprise version of the plugin you will receive an email with the zipped plugin files. Upload the uncompressed folder wp-business-intelligence-lite to the /wp-content/plugins/ directory. It works with any version of Microsoft SQL Server that PHP can connect with using the official Microsoft PHP Drivers. See their compatibility matrix for more information, but it should works all the way back to SQL server 2008.